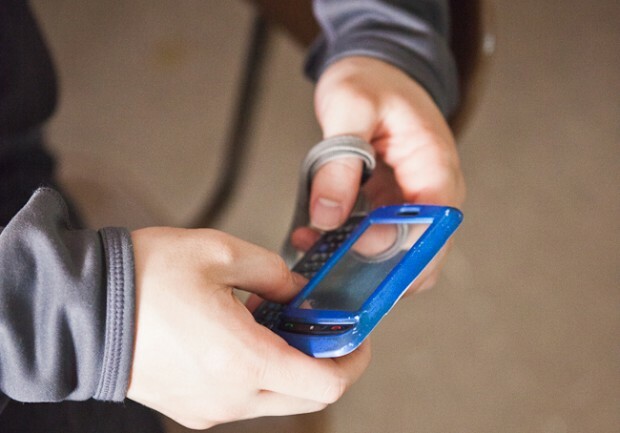 A good rule of thumb for any classroom use of cellphones: the lesson/activity must be engaging as well as productive. You don’t want technology for the sake of technology (and students aren’t going to be intrinsically fascinated with a device they use routinely when they’re outside of school). If the students don’t enjoy what they’re doing, they will be more tempted to use their phones inappropriately. IN-CLASS POLLING/QUIZZING. Educators like using the program called Poll Everywhere. It’s free for audiences up to 40, and allows you to create quiz questions for which students text in their answers. No expensive clicker systems to buy, set up, and maintain. If students register their cellphone numbers (a requirement in my class) you can even track their answers for impromptu quizzes or review. IN-CLASS BACK-CHANNELING: Backchanneling refers to the use of networks & social media to maintain an online, real-time conversation alongside spoken remarks. For example, if you attend a keynote presentation at a conference, you’ll often find that some listeners in the audience are using their mobile devices to comment to other audience members about things the speaker is saying, while the speaker is saying them. Backchanneling can be a great way to give quiet students a voice, to introduce additional facts and insights during a lesson, or simply to encourage “conversation” during lecture or group readings when you don’t want to actually interrupt the presentation. While Twitter is probably the most popular medium for backchanneling news and entertainment events (using #hashtags to create an instant network), teachers may want a more controllable platform than Twitter provides. Teachers can set up a variety of a private backchannel using free webtools, like Today’s Meet, which allows individuals to create temporary rooms to host backchannel discussions. Poll Everywhere can also be used for this purpose. Plus, it allows you to moderate comments and prohibits any anonymous contributions. IN-CLASS READINGS AND HANDOUTS. Smartphones can also be used productively in the classroom as eReaders for books and handouts. You can place all student handouts into DropBox folders (see “Dropbox A Multi-Tool for Educators”). Students can access Dropbox space and open reference material without printing it up or asking for a new copy during class assignments. Of course, for traditional reading materials (textbooks and paperbacks), you can use mobile apps like Kindle eReader, Nook App, iBooks, or Google’s Play Books (just to name a few). Many of them host free content and some allow you to load content of your own. This is a great way to save money on book purchases and photocopies. Using these apps, students can even highlight and annotate. ORGANIZING RESEARCH. “Camera scanners,”which capture information using the phone’s built-in camera, allows students to take pictures of documents (even books with those bendy pages), crop them, and then enhance them for ready viewing. You can create notebooks of documents (if you are copying sections of a book or article) and then store them on the device or export them (as a photo image or PDF) to Google Docs, DropBox, Evernote, and more. It’s a great tool for you or your students to organize research materials. One of the best apps for this purpose isGenius Scan+ – available for iOS, Android, and Windows based phones. Evernote is another great application that students can use to organize their notes and images, take voice notes, write notes by hand, gather web clippings, sort emails, and more. You can put them into pre-categorized folders (class, project, theme, etc) as well as give them “tags” which makes them easy to search and sort later. Most people can grasp the power of having Google in their pocket, but few recognize that the mobile version of Google is much more than a web browser. One of the cool features is its ability to perform searches using images. This feature, called Google Goggles, is a creative way to search the Internet for image-based content (watch the video). See how it was used in a creative field trip experiment at the local museum. These mobile Google capabilities offer a great way for students to explore material on the fly, using a variety of media. Any content, images, etc. that they find can be sent to a Google Drive account. Jennifer Carey teaches at Trinity Valley School in Ft. Worth, Texas and blogs at Indiana Jen. A version of this post appeared on Voices in the Learning Revolution.